Tansel is the only company in Australia offering high quality stainless steel products that maximise space and enhance functionality of storage within the home, with a guarantee to never rust. For over twelve years now, Tansel proudly supplies Australia’s leading kitchen companies, cabinet makers and retail customers. Products are available directly through us as well as Nover & Co. No two cabinets are the same so we offer professional expert advice over the phone or email to help you select the most suitable products that meet all of your home storage needs. Organising Solutions helps create space and order in your home and business. Whether it’s sorting a wardrobe, kitchen, an office or your entire house or business, we provide practical support to help you become more organised and advice to build your organising skills. Impressive Built-in Wardrobes and Storage Systems have been established for over 20 years. They are experts in their field of building wardrobes and storage systems for all project types. Since 1992, Impressive Wardrobes has grown to be a market leader in its industry. By aligning efficiency with innovation, Impressive Wardrobes has ensured all its customers receive the best quality products at the most competitive prices in the market. Impressive Wardrobes designs Built-in Wardrobes and storage systems according to the highest level of Australian design standards. We assess every installation to ensure that it meets a guideline of design factors covering performance, maintenance value, ease of durability, appearance, safety and construction. This ensures that all our installations are well designed and built to last. Our Mission "To become Sydney's leading built-in wardrobes supplier through the supply of high quality products, customer service and innovation." QUALITY, ROBETEK CUSTOM DESIGNED BUILT IN WARDROBES. RobeTek Industries specialises in quality, custom designed built in wardrobes in Sydney at affordable prices. Built in wardrobes, Walk in wardrobes, Laundry Storage & Linen Cupboards, Living Room Storage & Custom Entertainment Units, Garage Storage Ideas, Home Office Storage / Study Areas and more! We offer a free measure and quote in the Sydney metropolitan area. Call us now on (02) 9608 8899. Rebel Wardrobes prides itself on being the leading supplier of custom wardrobes and shower screens in Sydney. Enquire now. Rebel Wardrobes is Sydney’s leading provider of custom built in wardrobes and shower screens. We have been around for many years and are passionate about delivering a complete end to end service based on affordability, efficiency and convenience. Innovative Spinning Furniture that transforms your messy room into the organised space you have always dreamed of. All designs maximize the corner space in a room, wardrobe and kitchen delivering a dramatic increase in storage capacity. 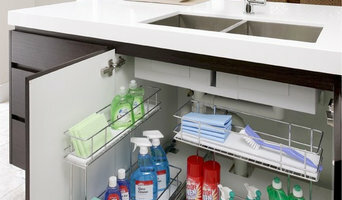 We are located in Southwest Sydney (Australia) and we are suppliers, importers and installers of both ventilated and melamine shelving systems used in wardrobe, pantry, linen cupboards and all household storage areas Since the year 2000 we have built our reputation as the industry leader on a commitment to offer complete customer service and total customer satisfaction. From our free on site no obligation consultation to our custom tailored designs to the highest quality range of products. Even with these comprehensive services our products offer the best value in the industry. At Superior design group, we aspire to bring excellence & quality to your environment, with the charm and style of our superb products we offer a huge range of desirable designs and colours to suit your décor and living…. That’s what makes us superior! We provide a full range of services from basic bookkeeping, complete payroll, accounting services, replacing and supporting internal accounts departments. Experts in home organisation can help streamline and organise your home life. They provide bespoke storage solutions and strategies to ensure everything in your Sydney, New South Wales home has a place and you can live comfortably. Some can help you regain control of your entire house, while others specialise in specific areas, such as wardrobes, offices, paperwork and collections. They also provide coaching so that you can maintain your new organised space. Find a wardrobe, storage and organisation expert on Houzz. Scroll through this page to find Sydney, New South Wales professionals who can design and install storage solutions, as well as provide home organisation services. You can browse their previous work, read reviews and see how other homeowners rate their customer service, product and expertise.